New training dates for 2017 are now available. Book now to reserve your place. Be amongst the first to know about "what's new" in NLP training and resources. META delivers the highest quality training at the leading edge of NLP ™. 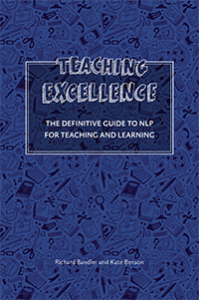 The definitive guide to NLP for Teaching and Learning. Isle of Wight – U.K.
Kate Benson is the International Director of Education for the Society of NLP ™ has been working closely with Richard Bandler the co-founder of NLP, for many years to develop effective strategies for Teaching and Learning. There latest book will be available at the end of November. You had the secrets of Teaching Excellence!! Kate Benson is delivering 2 mini conferences this year together with other fantastic NLP trainers.